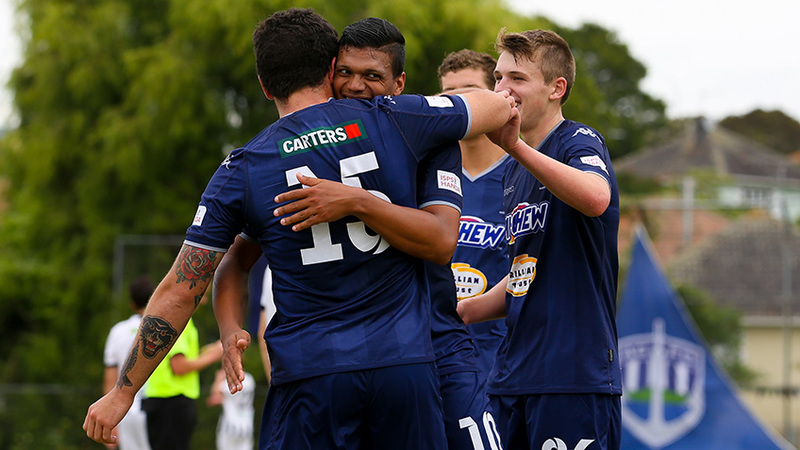 AUCKLAND, New Zealand - The Navy Blues stay top of the ISPS Handa Premiership after a come-from-behind 3-1 win over Tasman United at Kiwitea Street. The match marked the first home appearance for Solomon Islands international Micah Lea'alafa while head coach Ramon Tribulietx and star striker Emiliano Tade were both absent. Vanuatu international Brian Kaltack nodded Tasman United in front on the quarter hour mark but two goals within five minutes prior to the break from Darren White and Ryan De Vries gave Auckland City FC a flattering halftime lead. Goalkeeper Enaut Zubikarai was in outstanding form denying Maksym Kowal early on when he pushed an effort onto the crossbar then Kaltack's late header. The points were made safe when De Vries notched his 10th goal of the season from the penalty mark with five minutes left to play. Stand-in coach Ivan Vicelich was happy to see Auckland City FC pick up a victory after the deflating Club World Cup exit to Al Jazira over a week ago. "We're very happy to get the three points. Tasman United worked very hard and we battled hard and played a good game and pushed us very hard. "It was a tough week for us after coming back from Al Ain and the FIFA Club World Cup and mentally having to lift again. It was great to that win. "We played some good football and very happy with that. We didn't play the best and went through the motions. "Across the board we played well. We were missing a few players and it was good that the players who came in contributed and did well," he said. Auckland City FC finish the calendar year top of the ISPS Handa Premiership following Team Wellington's 0-0 draw with Southern United which means the Navy Blues open up a two point gap on the defending champions. Elsewhere, Eastern Suburbs AFC defeated Waitakere United 2-0 thanks to a first half brace from Andre De Jong, Canterbury United were comfortable 3-0 winners over Hawke's Bay United, while Hamilton Wanderers picked up their first win of the season after they defeated Wellington Phoenix 4-2. Auckland City FC's next match is on Saturday 6 January 2018 when they take on Waitakere United in the Super City derby at Kiwitea Street. AC: Enaut ZUBIKARAI (GK), Darren WHITE (Takuya IWATA 73'), Te Atawhai HUDSON-WIHONGI, Angel BERLANGA (c), Dan MORGAN, Albert RIERA, Cam HOWIESON, Fabrizio TAVANO, Micah LEA'ALAFA, Ryan DE VRIES (Kris BRIGHT 90'), Callum McCOWATT. SUBS: Conor TRACEY (GK), Harry EDGE, Reid DRAKE.